The Datto Hybrid Cloud Platform is the most reliable and efficient way for end-users to back up their data securely and ensure that it is recoverable in any disaster scenario. The Datto Hybrid Cloud Platform combines the best of a hybrid cloud solution with technology only available from Datto to deliver the most feature rich, efficient, and lowest-TCO backup and continuity solution. On-prem servers are protected on Datto appliances and mirrored automatically to the Datto Cloud, improving fault tolerance while reducing the reliance on bandwidth speed. Private cloud solutions enables businesses to have complete control over their cloud environment, but are very expensive to implement and maintain. Public cloud is cost-effective, but the lack of control of data center resources, monthly fees, and increased support costs can be a hinderance. With a hybrid cloud model, a single, unified platform is created where a business owns some form of local hardware, which is then integrated with resources owned by a third party. With a hybrid cloud backup solution, replicated backup images from local backup devices are stored and archived in proprietary data centers, so they can be accessed in the event that backup records are not available locally (i.e. a disaster scenario). Having the cloud infrastructure developed by a third party is valuable to end-users because through economies of scale, and backup cloud vendors can provide space in the cloud at lower costs per GB than the average MSP could provide if they built their own cloud. But not all hybrid cloud is equal. Datto takes it further with Datto’s Hybrid Cloud Platform that uniquely leverages Datto’s integrated and converged BDR appliances, as well as Datto’s inverse chain technology, to effectively unify backup with an asynchronous mirroring / DR solution. The hybrid cloud backup process provides a great deal of data security by generating a backup locally, and then replicating the backup off-site. With local hardware, all data is in-house, protected by pre- existing firewalls, security protocols, and the encryption inherent to the backup device. Furthermore, by sending encrypted data to dedicated data centers, users are ensured that there are redundant copies of the data secured off-site in the event of a disaster. Finally, while ensuring backups are available is necessary, equally valuable is knowing there is no loss of data integrity. 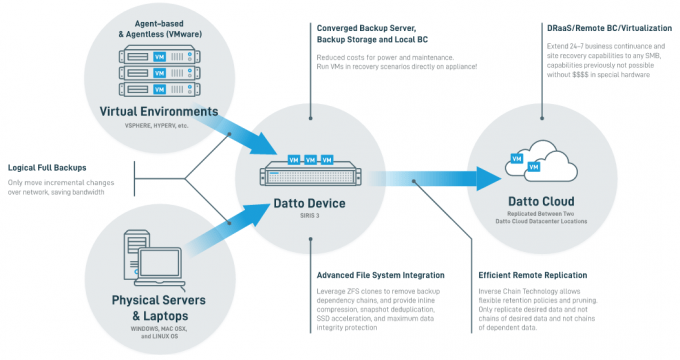 Datto uses the advanced ZFS file system both onsite and within the Datto Cloud, since it takes precautions to checksum data on multiple levels to ensure data integrity is never lost. ZFS even maintains data checksums while it being processed in memory! A benefit of hybrid cloud solutions is that the entire backup is not solely housed on-site. The Datto Hybrid Cloud Platform allows the Datto Cloud to be leveraged for effectively unlimited offsite capacity via Time Based Retention. Files can be restored with ease whether they are on-site or off-site, so businesses do not need to worry about losing on-demand access to their data. This offers a great benefit to smaller businesses, because it provides some flexibility if the local backup device has limited storage. In the event that a business starts to run out of space on their device, they prune off local copies of older backups that have already been replicated and secured off-site, a flexibility only possible with Datto’s Inverse Chain Technology. This reduces the necessity to purchase more local storage as a result of data growth. This is a huge pain-point for users, as many businesses do not have the resources to purchase, house, and maintain a backup infrastructure that is scalable to their data growth requirements. A hybrid cloud platform offers SMBs the best means of fulfilling these regulatory requirements. To remediate data corruption, for example, an SMB needs to roll back to the most recent possible uncorrupted version of the data. However, data corruption events often escape immediate detection. That means that an SMB depending exclusively on local backup would have to maintain numerous incremental versions of every file under such regulatory mandates. This would obviously add to the cost of data protection. An off-premise cloud solution is much more practical for this type of multi-increment protection. Datto’s Hybrid Cloud Platform goes a step further. Even though data integrity loss is virtually impossible with Datto’s advanced storage technology, backups date integrity is are still automatically checking via Datto’s Screenshot Backup Verification – and by automatically alerting if a data integrity issue has been detected. This automatic alerting protects both the SMB and the MSP from the data corruption that can occur in the backup process itself. This is a non-trivial risk that can be especially problematic when it involves data covered by regulatory mandates. It also provides a means of tangibly demonstrating to regulatory auditors that appropriate mechanisms have been put in place to fulfill the requirements of those mandates.